How about a threepeat all in one year? No one has ever won two Pro championships in the same year in the Mickey Thompson Performance Tires MiRock Superbike Series before. 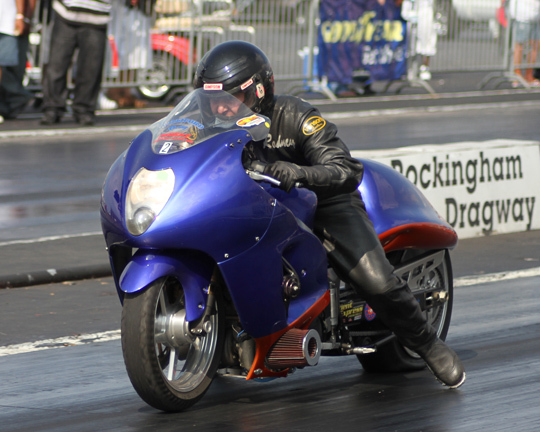 Not only does 20 year-old Ohio rider Jeremy Teasley have a chance at that feat in the nation’s largest all-motorcycle drag racing series, but he can also add a sportsman championship if all goes his way at Rockingham Dragway’s Lee’s Performance Finals on November 6-7. Teasley already has the HTP Performance Real Street title locked up, but still has a chance for two wins in the class at The Rock. That’s because the Fast by Gast Superbike Finals at Maryland International Raceway was hit by rain before the final was run. Teasley and the Adams Performance/RS Motorsports Kawasaki ZX14 will face number 1 qualifier Johnny “Turbo” Dobrin in the Maryland final at Rockingham on Saturday before running the full ladder of eliminations on Sunday. Orient Express Pro Street number 2 plateholder Rodney Williford holds a sizable but not insurmountable lead over Teasley in that class. Teasley seriously damaged his Pro Street title chances by failing to qualify last time out at Maryland. 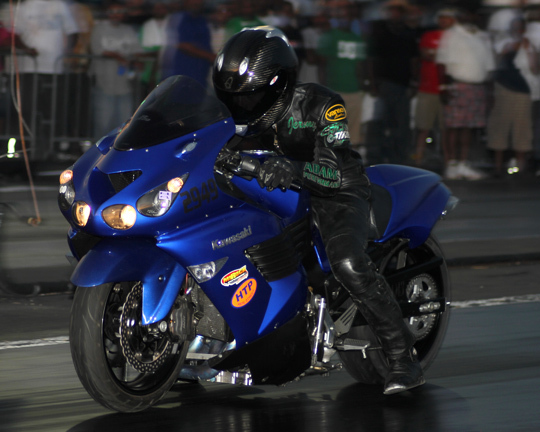 He and the team were shooting for the record on the Adams Performance nitrous huffing ZX14 and failed to keep the rear tire glued to the track. Early season performance leader Williford has maintained consistency throughout 2010 and will be hard for Teasley to pass at Rockingham. The challenge for Teasley in House of Speed Crazy 8’s isn’t much easier. Points leader Eddie “Who” Chapman leads Ray Morris by 40 points with Superstar Rickey Gadson 11 points further back in third and Teasley fourth, 80 points behind Chapman. Randolph “Boo” Brown takes an 80 point lead into the final FBR Shop Quick 32 race of the year. Second place Jimmy Shifflett will fight Brown for that title, as well as defend his lead in Motorcycletireoutlet.com 5.60. As always, there will be two nights of Schnitz Racing Street ET and Nitrous Express Pro ET bracket racing, as well as that hustler’s paradise known as Afterdark Underground running deep, deep into the night. 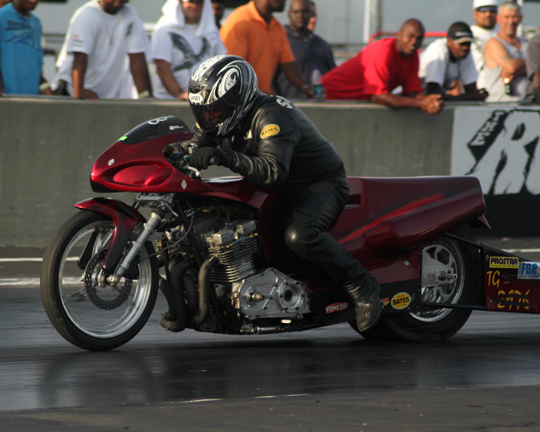 New to the event will be Rickey Gadson’s Stock Wheelbase Challenge. The nation’s top 20 riders will match weights on identically prepared stock wheelbase ZX14’s and battle it out to see who’s best. You won’t want to miss this! This last chance event of the year is always off the hook with huge fields and festive Carolina crowds—the perfect setting for ending points battles and settling grudges. Those who can’t make the trip to Rockingham can see all the results in real time at 1320go.com.